Kokubo has been criticized for his 'hip-hop' style. 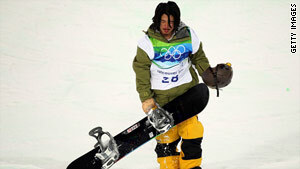 Tokyo, Japan (CNN) -- Olympic snowboarder Kazuhiro Kokubo is the talk of Japan. Not for his athletic ability -- but for his appearance. The 21-year-old member of Japan's national team unwittingly caused outrage from cabinet-level government lawmakers to the patrons at the corner pub when he arrived in Vancouver for the winter games. Kokubo was wearing the team-issued uniform, which consisted of a suit, shirt and tie. But he wasn't wearing it quite right. Kokubo's shirt was untucked, his pants hung low below his hips, and his tie was loosened revealing an unbuttoned shirt. Kokubo sported dark glasses indoors and double nose piercings. He also wore his hair down, revealing a mane of dreadlocks. Japan's Minister of Education, Tatsuo Kawabata, was not a fan of the hip hop twist to the national uniform, to say the least. "It's extremely regrettable that he dressed in a totally unacceptable manner as a representative of Japan's national team," said Kawabata, on the floor of Japan's parliament. "He lacks the awareness that he is participating in the Olympic Games as a representative of our country with everyone's expectations on his shoulders. This should never happen again." The Japan Ski Association decided to punish Kokubo, along with his snowboard team manager Fumikazu Hagiwara and two coaches, keeping them from attending the Olympic opening ceremony as a show of regret. But the punishment didn't stop there. Back at home in Japan, multiple viewing parties for Kokubo were cancelled across the city. Kokubo's arrival in Vancouver was televised again and again on news broadcasts, analyzed by reporters and cultural experts. Kokubo's father even felt compelled to publicly apologize to the nation on behalf of his son's appearance. In Vancouver, Kokubo held a news conference and apologized for "causing trouble to many people." In post-news conference analysis, television commentators called Kokubo's apology inadequate and his attitude appalling. "Japan is behind the times," retorts Mika Sunaoka. Sunaoka is a hairdresser at Jambo Beauty Salon in Tokyo, a salon that specializes in black hair fashions. International and Japanese clients get weaves and dreadlocks here. If you're Japanese and you really want to celebrate hip hop culture, you can look the part here. To Sunaoka, Kokubo is embracing the lifestyle. "Kokubo went to Vancouver to snowboard," she said. "That's what should be evaluated. It's totally wrong to criticize him about his clothes and hair style." Customer Shu Noda, who is in Sunaoka's chair getting his dreads tightened, believes the flap began because Kokubo was wearing the uniform inappropriately. "I like street fashion," said Noda. "I think it's cool. But this is the national uniform for the Olympics. We can't blame him if he wears it in his private time, that's his choice. But it was the uniform provided by his country and he should have worn it right. I do think the dreadlocks and nose piercing are just fine, though." Sunaoka and Noda started bantering back and forth about Kokubo and Japan's rigid social rules. The consensus in the salon is that this is all overblown and Japan does need to loosen up. Meanwhile at the Olympic games, Kokubo hit the half-pipe and failed to medal. That's just part of tonight's news coverage on Kokubo. The bigger question is how he'll look when he lands back home in Japan.